After some strange behaviour in gPodder 2.20.3 yesterday on my N900 (not responding to episode actions), I quit gPodder and tried to start it up again, but it would crash during startup everytime with an error about “database disk image malformed” from line 316 of dbsqlite.py on the query: “SELECT COUNT(*), state, played FROM episodes GROUP BY state, played”. I could run that query and others no problem. And, voila, gPodder is working again. Updated: I’ve updated this guide to detail a proper sync with Snowy, rather than the old Unison hack (below), since Conboy now supports more than just Ubuntu One, and an experimental version Snowy is operational. I’ve been a regular user of the fantastic Tomboy note-taking application since I replaced my Palm Pilot with a Nokia N900. With Conboy, a Tomboy client for Maemo, and Snowy, a web application for Tomboy notes, it seems like the perfect platform for uniting personal notes across the desktop, mobile and web (except for one drawback: Tomboy itself is a Mono application…). Initially, I used a hack with Unison to synchronize Tomboy files manually between my N900 and laptop, but I recently moved to proper, albeit still experimental, syncronization through my own Snowy server. Snowy is a Djano-based, AGPL web service for Tomboy notes, currently under heavy development (and still labelled as experimental). I installed Snowy on my own Ubuntu web server using the official installation guides. I went with mod_wsgi, though I have Django running via mod_python on another server. The debugmail step in the INSTALL file within the Snowy source directory didn’t seem to work for me, but I’m not too concerned about email yet. I’m just running this for me and my family. I’ll likely revisit this later. Between the time that I followed the INSTALL steps and when I went to first sync from Tomboy, I had decided to switch the installation to a slightly different URL. I couldn’t figure out why the sync didn’t work, but it turns out I still had the old URL in the Django Sites table. Just a silly mistake on my part. Tomboy comes packaged with the web sync plugin in recent versions of Ubuntu. Log into Snowy in your default web browser. Select Tomboy Web as the Service, and put in the root URL of your Snowy installation as the server. Follow the instructions to authenticate, save your settings (I set Tomboy to automatically sync every 60 minutes), and synchronize! Conboy focused on supporting the proprietary Ubuntu One web service first, but it now supports synchronization to any Tomboy web service (though the feature is labelled Beta). The only problem I had setting this up was a strange error about a missing api-ref and local time, but it turns out Conboy just didn’t want a trailing slash in the URL (seems like the trailing slash prevented proper authentication at the sync stage). Log into Snowy in your default Maemo web browser. Open Conboy, and go to Settings in the main application menu. Click Authenticate and follow the instructions. I’m super happy that the Tomboy / Conboy / Snowy combination is now ready to use, but do pay attention to the beta nature of Conboy sync, and the experimental nature of Snowy — make sure to backup your notes regularly to avoid any data loss. I’m happy to be a guinea pig myself. Disclaimer: this is a hack from someone who doesn’t know Tomboy well. It worked for me, but YMMV. And I have backups. And, mostly importantly… why aren’t you using Snowy now instead?. The instructions below should be treated as a hack preserved for historical purposes. I wanted a way to sync Tomboy on my Ubuntu desktop with Conboy on my Nokia N900, but Conboy only syncs to Ubuntu One—a proprietary web service. Snowy synchronization support is supposed to be on the way, but Snowy itself is still under heavy development, so this might be a great option in the near future, but not today. A comment on maemo.org made me think that rsync over ssh was a possibility, and a quick rsync showed this to work (as far as I can tell). The trick is being able to sync changes back and forth; rsync can’t handle updates to both the source and destination—it’s unidirectional. Hence, Unison—a bidirectional synchronization utility. In case it’s useful to anyone else, this is how I’ve setup Unison to sync notes between Tomboy and Conboy. First, I want to be clear that this is a temporary hack while I wait for proper synchronization support through Conboy with Snowy. Prerequisites: I already have OpenSSH running on my server, and I have key-based ssh access configured from both my laptop and N900. Unison syncs remotely over SSH. What this does: It allows me to synchronize notes and changes to notes from my N900 to my laptop, and potentially to any number of other computers. What this doesn’t do: Unison has support for handling conflicts, but it’s not the least bit Tomboy-aware. A proper Tomboy sync might give you the option of renaming a note that has been changed in more than one place, but with Unison, you’ll be looking at diffs and merges of cryptically named XML files. So, I don’t recommend relying on Unison to sort out conflicts. I plan to sync often, backup often, and avoid conflicts as much as possible. This is for advanced users. Tomboy Concerns: I’m using Tomboy, but actually quite uncomfortable with the risk, since it depends on Mono. I’ve considered switching to Gnote, but haven’t yet because I’m concerned about losing data/synchronization compatibility. But, this solution might work for Gnote too, and I may well s/Tomboy/Gnote/g in the near future. I have Ubuntu on both my laptop and server right now, and I’m syncing through that server (instead of directly to my N900, which would be another option). I decided to sync my notes with the Tomboy directory on my server, which is also a workstation. Tomboy doesn’t automatically look for changes to notes on the file system unless you enable the NoteDirectoryWatcher Add-in: Edit > Preferences > Add-Ins > Tools > Note Directory Watcher > Enable. This way, Tomboy will accept any changes you get from the Unison sync. These were compiled for an older version of Maemo, but the command line version seems to be working fine for me in Maemo 5. Note, that if you use the GUI, it’s standard GTK, not a Maemo port, so you might need the stylus to use it. With Unison configured, I now have a basic, low-level sync between Tomboy and Conboy. I’m getting into the habit of syncing every time I change anything, to avoid conflicts. This should tie me over until a Conboy Snowy sync is available. 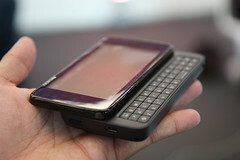 People keep asking me about my new “cell phone,” but the Nokia N900 isn’t a phone. It’s a handheld, mobile computer. Calling it a phone is like calling a house a bed—sleeping is just one thing you do inside a house. I became interested in the Nokia N900 in the fall, and after a several good reviews, I ordered one off eBay earlier this month. The N900 is the first from a series of Nokia Internet tablets to have cellular capabilities, but the SIM card doesn’t overshadow all the other things you can do with the device—it just frees you to connect to the Internet on the go. The day after it arrived, I signed up with WIND Mobile (another contributing factor to the purchase: leaving Rogers). The combination of a powerful mobile computer, and unlimited 3G data for just $35/month has changed the way I use the Internet. Yes, it can handle phone calls and SMS messages, but it’s totally arbitrary that a call is a cellular call as opposed to over Google Talk or SIP / VOIP, or that a message is SMS rather than IM; the same applications are used in either case. I can use it as a cell phone, but I can also use it as an Internet tablet, GPS, digital audio player, camera, etc. Maemo, the operating system that comes installed on the N900, is a fully-featured GNU/Linux distribution. Android shares a common (ish) kernel with other Linux-based distributions, but Maemo has much more in common with the operating system running on my laptop. It uses the same system for finding and installing new software, and it has a lot of the same applications available, since it’s easier to port from other GNU/Linux distributions. Rather than forcing developers to write Java “apps,” Maemo makes a variety of common development environments available. Thus, it’s the first platform to see a Firefox mobile release. It’s a computer, not a phone. And it’s not just semantics. When we think of mobile computers as merely “phones,” we tolerate restrictions that we would otherwise reject on our computers. How many iPhone users would come to Apple’s defence if they instituted the same strict policies and arbitrary limitations on third-party applications for a Macbook as they do on their mobile computer? (Update: I spoke literally hours too soon.) Recognizing that these devices are really mobile computers is an essential step to gaining control over our mobile computing. Carriers and handset makers control our phones. We should control our own computers. Google has tried to replace the term “smartphone” with it’s own buzzword — “superphone” — but it’s not just the “smart” part that’s become inadequate. It doesn’t make sense to call these devices “cell phones” anymore than it would make sense to call the buildings we live in “beds.” I have a handheld computer, and my carrier is my ISP.